The dawn of civilization, and you’ve decided to wake up to it. The early bird gets the worm, and it’s time to make your clan’s name in the annals of history. Will you be known as the builder of ovens? The keeper of cattle? The people person on the block? That’s up to you, but in order for there to be something to record, other people have to be there too. And you know how complicated things get the more people are invited to the party. Determine the destiny of your village and be a good neighbor…but not too good. 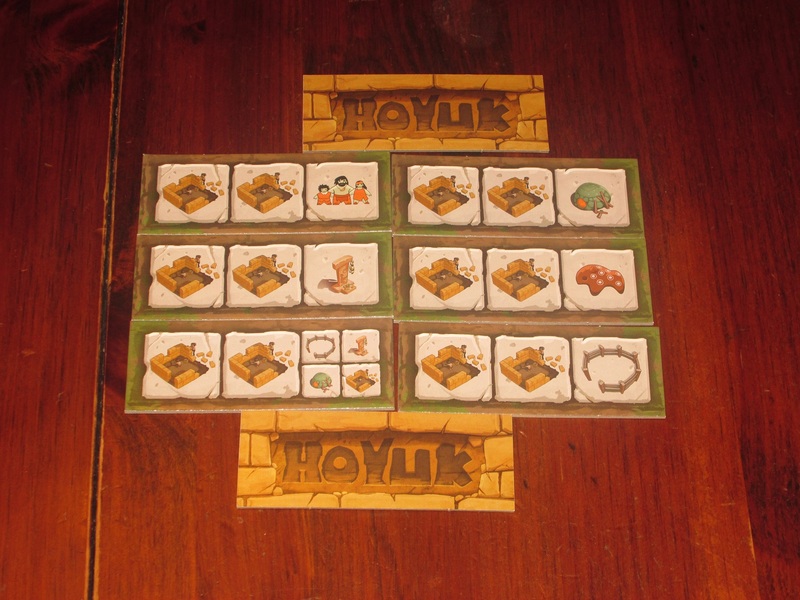 Hoyuk is a tile placement area majority game for two to five players. Players are leaders of ancient clans trying to be the most remembered tribe. The player with the most points wins. Hoyuk set up for three players. 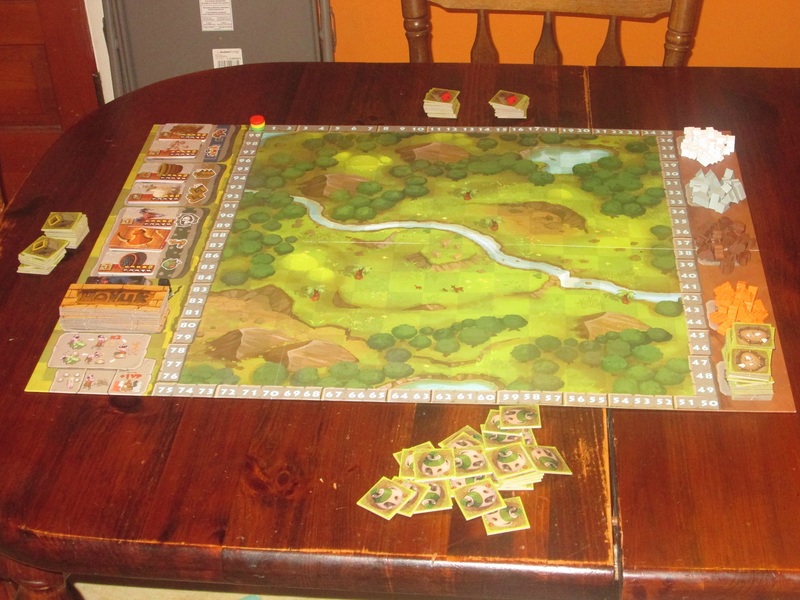 To begin, players take all the houses of one color and place the game board on the table. 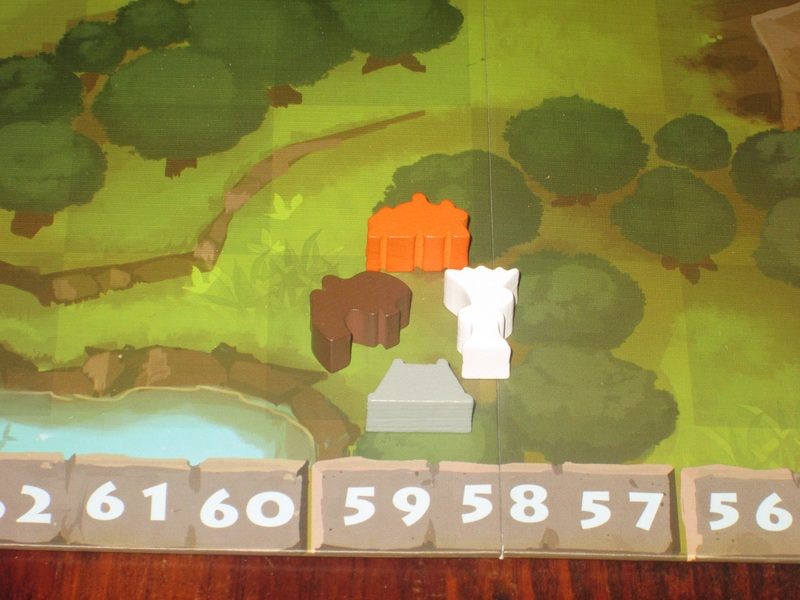 The feature pieces (tiles and wooden pieces) are placed on their spaces on the game board, and the aspect cards are shuffled and ten are placed on each aspect present in the game. The catastrophe cards are shuffled, as are the building boards, and each player places their scoring marker on the scoring track. One player receives the start player tile. 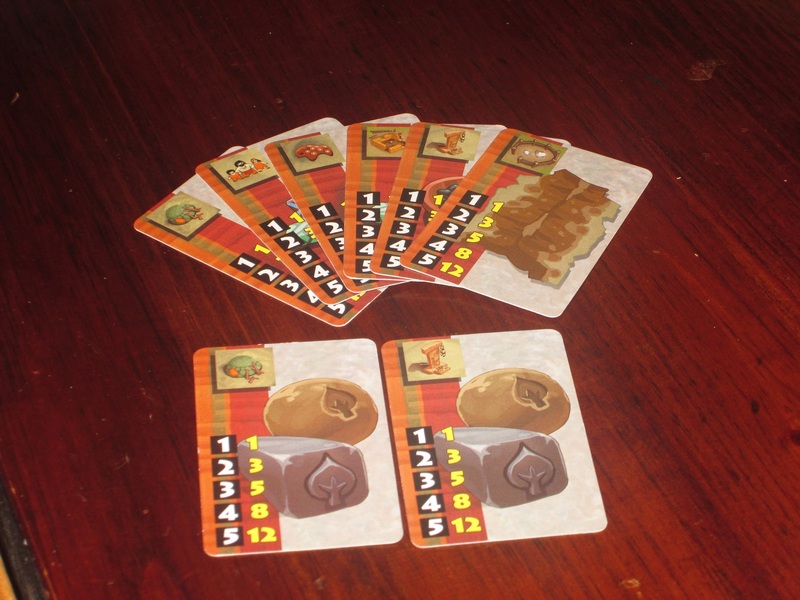 Hoyuk is played in rounds, and each round is played in four phases: build, catastrophe, aspect cards, cleanup. Building boards show two houses and something else. Each player will build two boards each building phase. 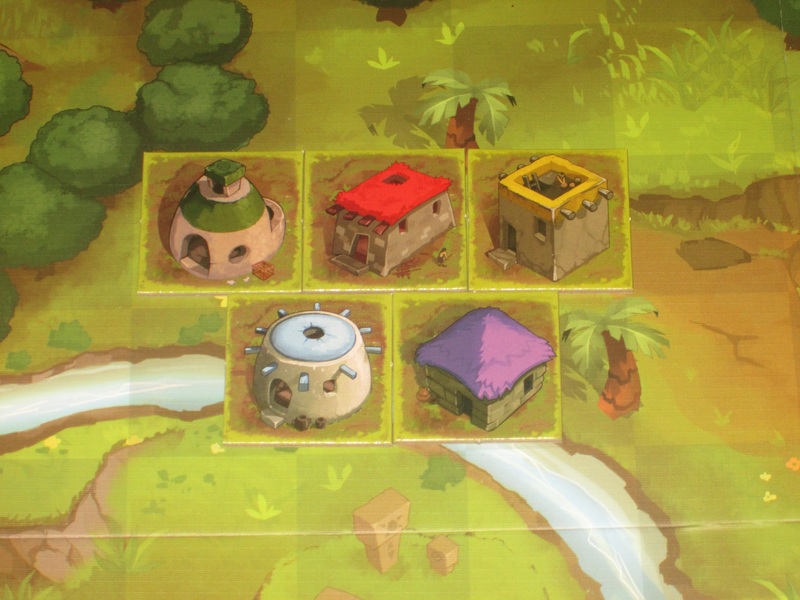 In the build phase, each player in turn will build two houses and one feature according to their dealt building board. 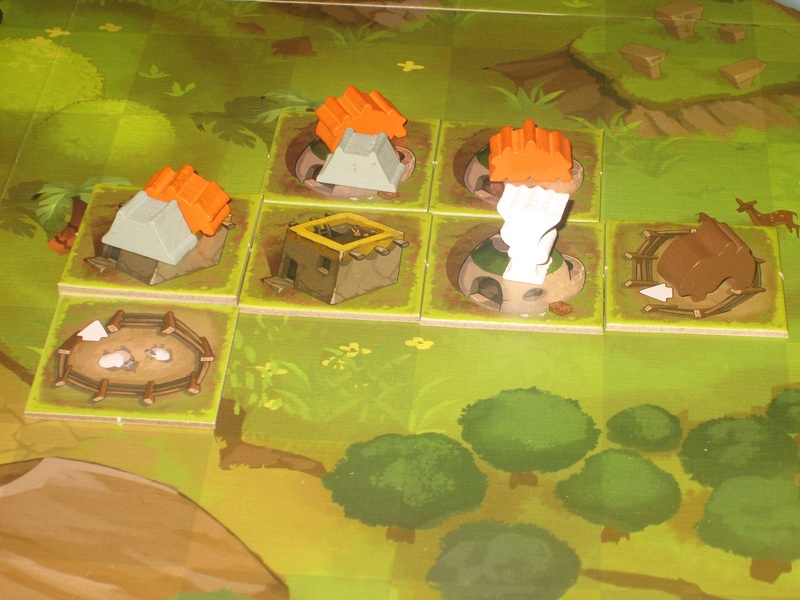 Players are building blocks (groups of tiles) and families (groups of their adjacent houses) in the village. The feature players build could be an extra house or a pen, animal, shrine, or oven. It could also include the shaman, which protects a block from catastrophe. 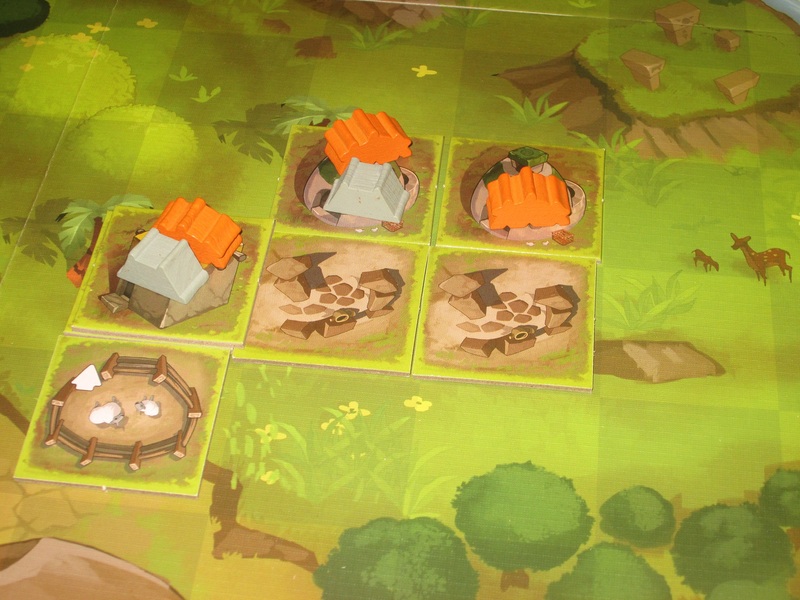 Players may place their houses almost anywhere, following a few simple rules: 1) if a house joins an already existing block, it has to be next to a house you’ve already placed there (if possible); 2) two blocks may never be joined up; 3) an animal pen may never be orthogonally surrounded on its four sides; and 4) a house may be placed on top of an already placed house to form a second story. Features are added to already existing houses following a few simple rules: 1) a house may never have both an oven and a shrine; 2) an animal may only be placed in a pen; 3) a second story may not be played on top of a feature. After players have finished building what’s shown on two building boards, a catastrophe hits. 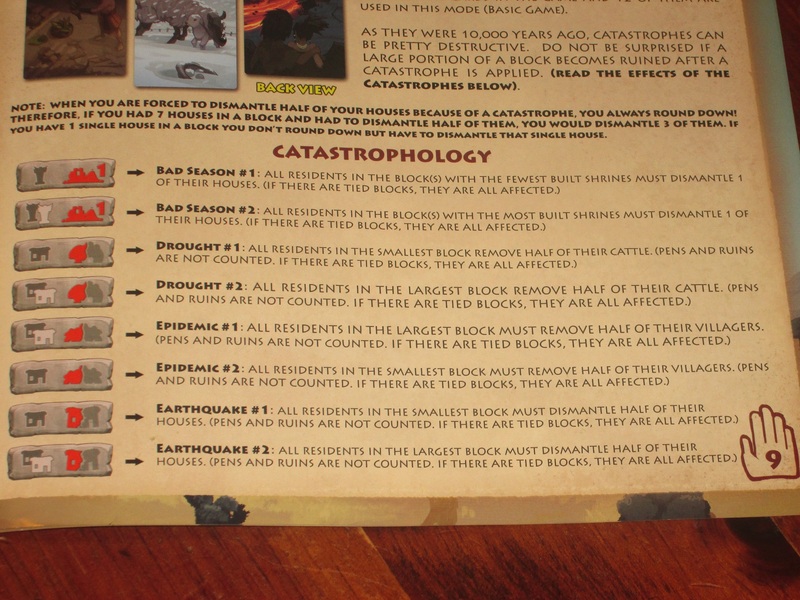 Catastrophes target blocks based on which block has the most or fewest of some feature–for example, houses, ovens, or shrines. The penalty is usually each player destroying some features or houses. If a block that would be affected by the catastrophe has the shaman figure, the shaman figure is removed and the block is unaffected. After the catastrophe phase, each block scores aspect cards for whoever has the most of each aspect in that block. The first player determines the order in which blocks score. Finally, in the cleanup phase, players place all their played aspect cards under a single card stack that has cards in it. (An empty stack is never replenished.) The first player passes the first player tile to a new player of his or her choosing, and a new round begins. The wooden pieces in Hoyuk. Before each phase in a round, beginning with the start player, each player may play one aspect card for each family they have represented on the board. These cards each show one of the features players can build and allow players to either build those features immediately or score points for holding sets of those cards. The game ends at the end of the round in which at least one player has built his or her last house. Players receive points for having the biggest family in each block, for having the most animals in each block, and for having the most villagers in each block. Each leftover card is also worth 1 point. The player with the most points wins. I’ve said before that it’s easiest to write a review that is either a rave or a rant. It’s hard to write a review that’s in the middle, which is where Hoyuk falls for me. The truth is, I’m pretty ambivalent about Hoyuk. On the one hand, Hoyuk is a decent game with lots of clever ideas, and I haven’t minded playing it. On the other hand, most of the people I’ve introduced it to were tepid about it, and I’m not that excited about it either. But first, let’s talk about what’s clever. Players are trying to collect these aspect cards, which can be used to build more features or to score points in sets. One of the things that attracts me most to strategy games is good trade-offs: you can’t do everything you want, and if you do one thing, you won’t be able to do something else. In Hoyuk, the aspect cards provide such a trade-off. Each card can be used either to build a feature (which will help with the further acquisition of aspect cards) or to score when played with other cards of the same symbol. So players have to decide: is it better to build their settlements, getting more features to help them gain more cards in the future, or is it better to hold those cards or cash them in for points? The aspect supply. The wooden pieces are nice and hefty. And I like that cashing the cards in isn’t guaranteed, meaning there’s some pushing your luck here. Because catastrophes can be devastating, players may want to bank their gains while they’re able, yet the scoring structure pulls players toward waiting. Because you can play only one card per family you have on the board, you have to make sure your families aren’t destroyed in order to leave open scoring opportunities. Of course, this points to another trade-off: you’re better able to score points if you build in just one spot and focus, but in order to play more cards, you have to spread yourself thin across the board. And more than just spreading yourself across the board, you have to convince others to spread with you. Blocks only score aspect cards if there’s more than one player present, so luring other players to build with you means giving them something they want in order to score yourself. Each player has a unique house color and type. These are easily distinguishable on the board. I also think the catastrophes provide a novel wrinkle. The catastrophes all target the block with either the most or the least of something. The gods aren’t interested in you if you’re mediocre: they want the poles. Because there are so many different scoring criteria to juggle, it’s hard to have your best settlements protected in the middle everywhere, so you have to hedge your bets. What catastrophes have already happened? Which others might still be in the deck? You might not know exactly what’s coming, but as long as you know to shoot for the middle, it helps with planning. Even so, catastrophes can be variable in the damage they cause. The catastrophe cards. These are well illustrated, although the iconography is not always easy to discern. Beyond the cleverness of the decisions, I find the thematic integration interesting. This is by no means a theme-driven experience, but the idea that building blocks together with other players both helps you and hurts you and the competing desire to strike out on your own and huddle together for resource sharing is interesting. The fact that catastrophes can be devastating points to the harsh reality of the ancient world. A sample block. Yellow would score ovens and pens; green would score villagers, animals, and shrines. The game also includes several variants, and players are able to tailor the experience to what they want. You can include as many aspects as you want. For your early games, you might want to stick to just ovens, shrines, and pens, but in later games, you can add animals and villagers. This might help players ease into the game. The rules also allow playing with fewer than the full number of houses for a shorter game. So despite these positives, why do I find it hard to recommend Hoyuk? The rulebook of Hoyuk is not the greatest. There are rules ambiguities (notable in aspect card playing), the all-caps font is difficult to read, and not using terms consistently reveals a lack of polish. Let’s start with the rulebook, which is…not great. First of all, the font throughout is in all caps, which makes it difficult to read overall. 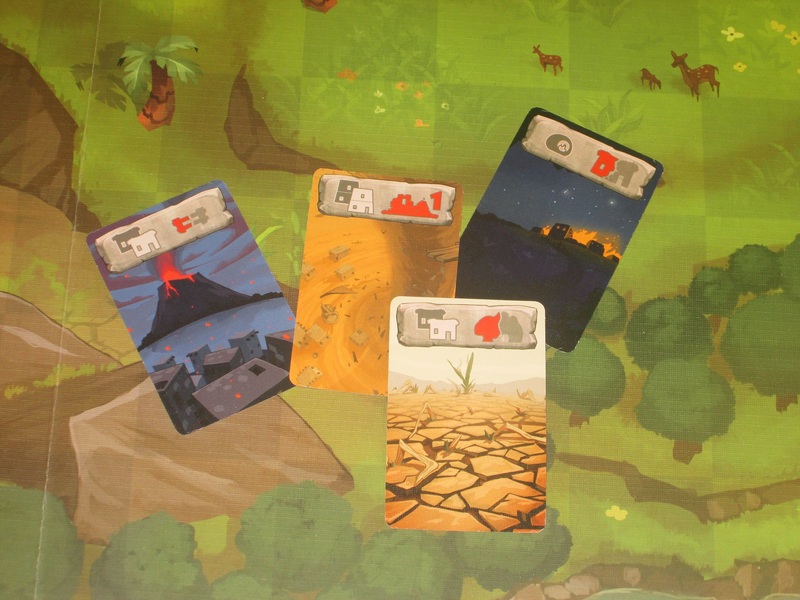 But perhaps most frustrating is that the simplest aspect of the game (tile placement rules) is illustrated with diagrams, while the most confusing multilingual portion of the game (catastrophe cards) are referenced by icon (many of which look similar) and name (which doesn’t appear on the card) instead of by illustration. It is difficult to find the catastrophe you need to find in the rulebook, at least at a glance. And beyond this, the rulebook is poorly laid out. For what should be a fairly straightforward game to learn (one player who played it called it a game for children), the rulebook doesn’t do it any favors. There are so many modules included in the box, each of which needs its own explanation, that it can be hard to track down the rules you need just to play. 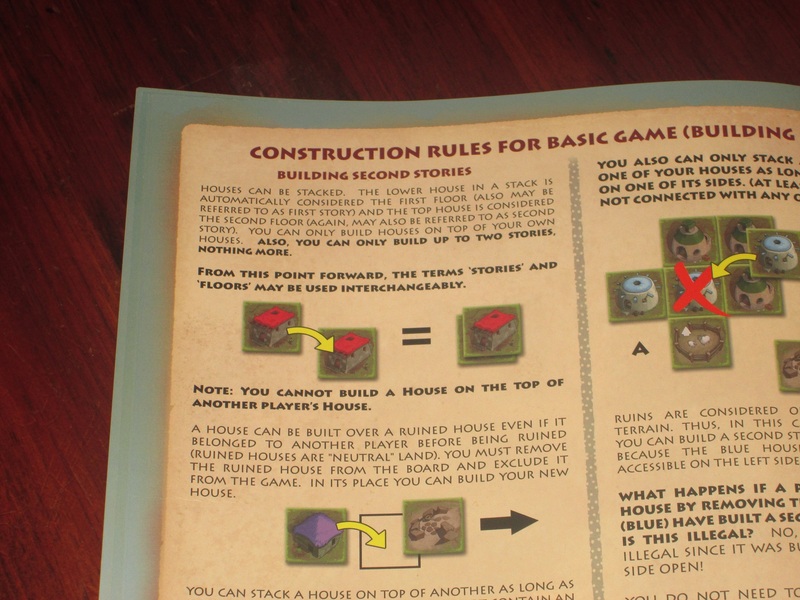 The rules also at one point say that they will use “second floor” and “second story” interchangeably. I suppose it’s better to acknowledge that something will be addressed both ways than not to address it at all; better still would be to use one term consistently, especially since there’s no grammatical or gameplay reason to use both terms. The catastrophe glossary. It’s hard to find what catastrophe you’re looking for at a glance. With frequent play, this might not be necessary, but in early plays, it is an annoyance to have to keep consulting such a frustrating resource. Unfortunately, this lack of polish seems to affect more than just the rules. The production is simultaneously beautiful and baffling. The board is large and lavishly illustrated, but the box is significantly larger than the contents merit. It is a standard-sized 12×12 box, but its box is much deeper than a standard 12×12 game, which is merited neither by the contents nor by the gameplay. (With limited shelf space, each game has to earn its volume, and Hoyuk does not perform very well in this test.) 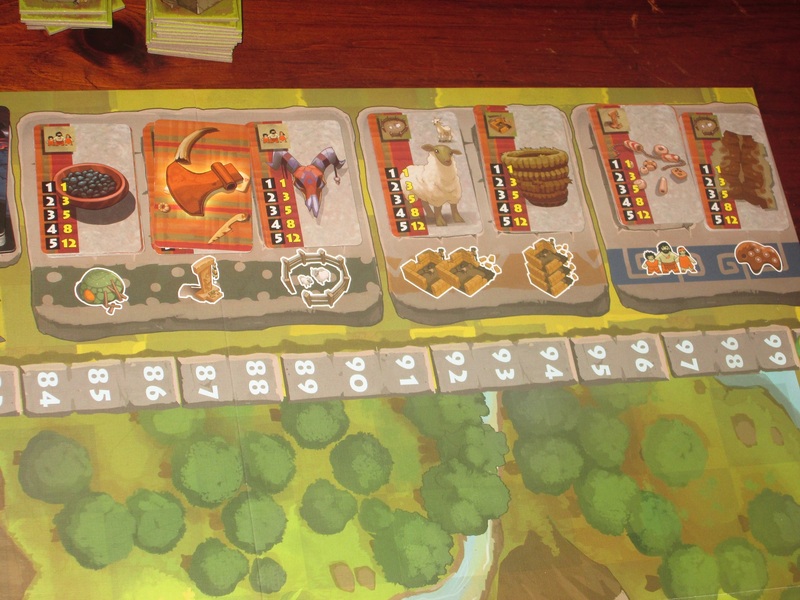 There are “building boards” that show players what they can build each round, which seem like an upgrade from cards, but these are hard to shuffle, and only one item changes from board to board (you always build two houses and something else)–it seems like the simpler and easier solution would have been to include cards. The catastrophe cards are well illustrated, but the only thing that matters is the icon at the top, and this is hard to discern–several of the symbols look alike. The icon is the only thing referenced in the rulebook, and it can be a bear to track down what the catastrophe does. The aspect cards are also well illustrated, but only a small symbol matters, and this is confusing to new players, especially since the illustrations repeat. Each game, players have asked, “So I collect based on the big illustration, right?” The wooden pieces are nice, and I do like the tiles included in the game. It’s just that the package as a whole isn’t quite there. A final block in a three-player game. But a poor rulebook and odd component choices are forgivable if the game is interesting. While Hoyuk does have some clever ideas in it, I wish those ideas had been polished a little more so that they shine. As it is, Hoyuk feels like a game that is just barely missing its potential. The aspect cards. These are the primary way the game is scored, which can be confusing to new players. One of these areas is the opacity of the scoring. I don’t mind games that you have to play multiple times to get a handle on. Concordia, for example, one of my absolute favorite games, similarly mystifies new players with its scoring system. The difference here is that Hoyuk is a game aimed at families. 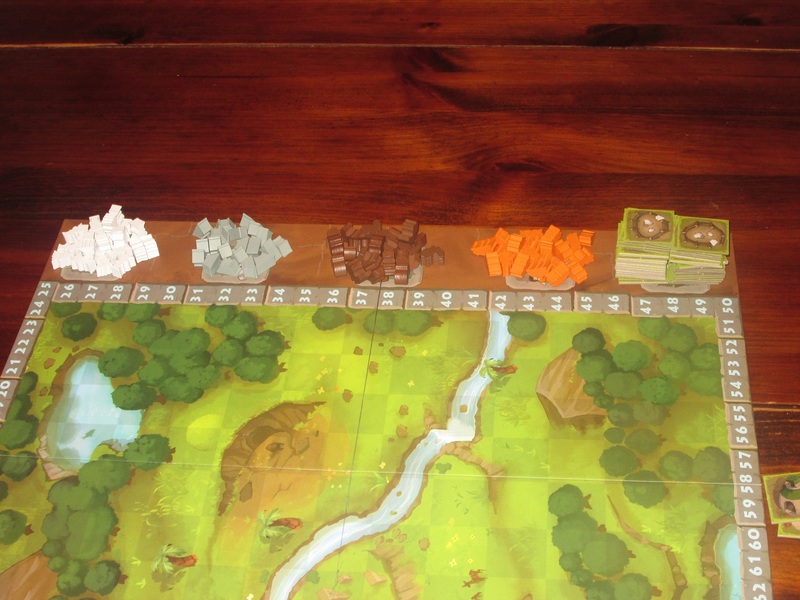 For a game that is mostly understandable–the rules are pretty simple, once you get over the hurdle of the rulebook–the scoring is very hard to wrap your head around. And even in Concordia, you will score a decent amount of points just by doing things that are fun on your turn. Even if you aren’t maximizing your score, as you learn to do through future plays, the gameplay itself points you in the direction of getting points. 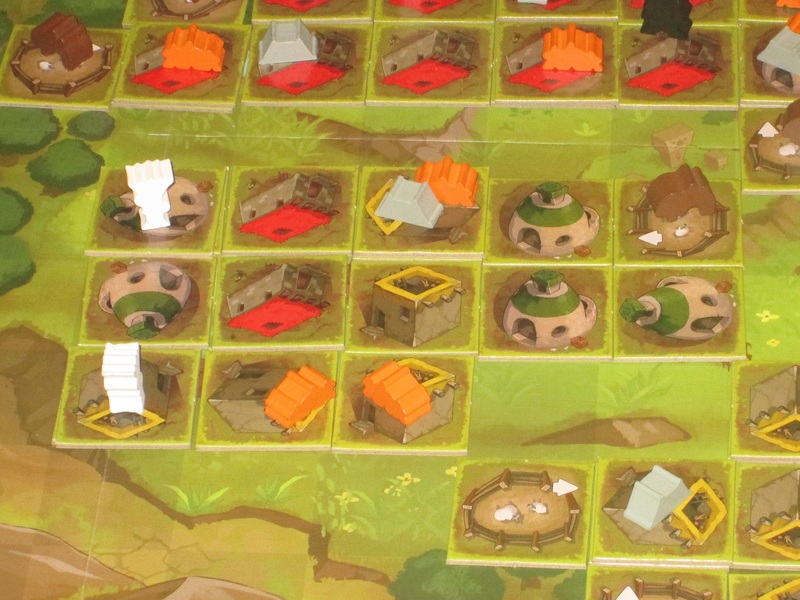 In Hoyuk, the fun of seeing your village expand doesn’t necessarily result in achieving aspect cards and thus points. Just building houses and aspects does not result in earning points. The scoring here works for gamers, but the gameplay (at least in my groups) wasn’t enough to keep them interesting. For the families that this game seems aimed at, the scoring will likely be too subtle. Also, for as interesting as the trade-offs should be, the game doesn’t feel tight enough. The rules encourage that players can reduce the number of houses they play with, which makes each move count more, but to my mind, there are still too many opportunities to play cards. Players can play cards before each phase of a round and can play as many cards at each opportunity as they have families on the board. (This is ambiguous in the rulebook, but the publisher has clarified on BGG that this understanding is correct.) I mentioned that one of the clever parts of the game is the decision to collect more cards or play them. With so many opportunities for players to liquidate their hands, this decision loses some of its gravity. It’s true that houses may be dismantled, but if the catastrophes don’t thin the herd, there’s very little tension in this decision. Because players are able to play all or most of their cards before the game is over, a decision that could have been a razor’s-edge dilemma feels like a blunt instrument. The right decision seems to be to hammer your point cards whenever you get a set. 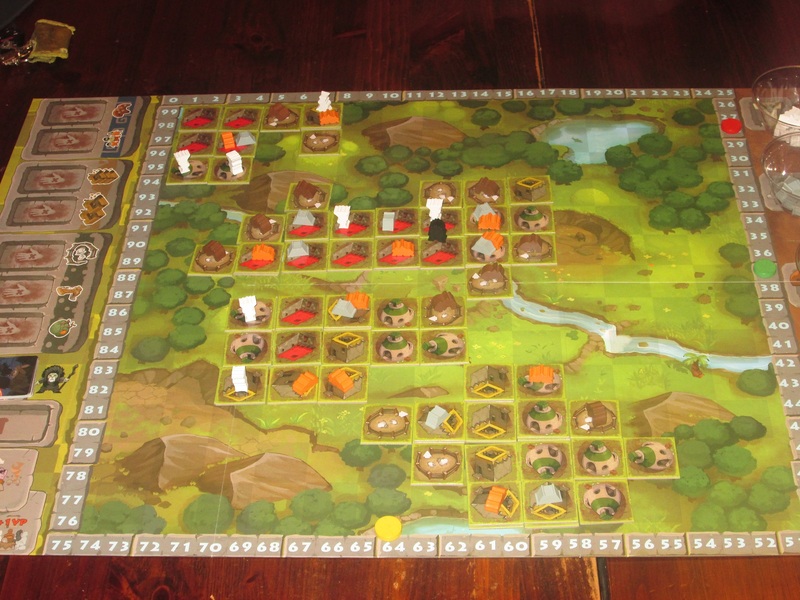 The board layout at the end of a three-player game. I’ve spent a while saying why Hoyuk doesn’t get me excited, but you shouldn’t read this as my saying that Hoyuk is bad or that you won’t enjoy your time with it. There are some very clever ideas here, once you get down to it, and I would not refuse this game if someone else suggested it. What I am saying is that there are many other games out there that are better polished and you can see the shine with a lot less effort on your part. Carcassonne, for example, is a more traditional tile-laying game, and its expansions add complexity if that’s what you’re after. If you want tile-laying-plus, Isle of Skye is excellent, and Cacao feels perhaps most similar to Hoyuk but is more polished. For me, those are the kinds of games I’m more likely to recommend and compulsively play. It’s not fun to continually answer questions about rough edges that, with a little more development work, could have been streamlined away, nor am I likely to pull out a game with my family that has me examining the rulebook at the table. 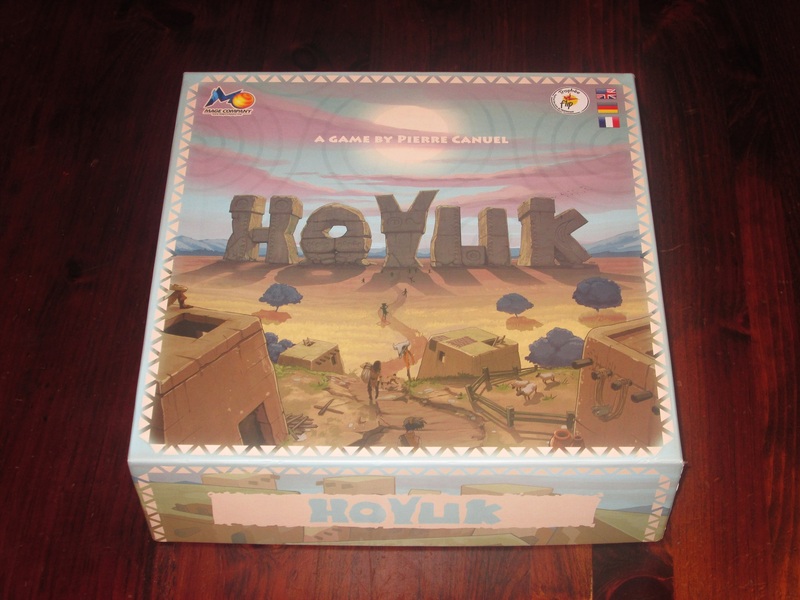 Hoyuk is a decent game, but it’s enough work to dig into the gameplay that I’m not likely to unearth it often. iSlaytheDragon would like to thank Mage Company for providing us with a copy of Hoyuk for review.